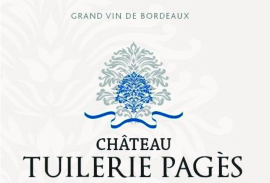 Chateau Tuilerie Pages is an outstanding white Bordeaux wine from Entre-Deux-Mers. Well known for extraordinary white wines, Entre-Deux-Mers (meaning “between the two seas”) the region is located between the Garonne and Dordogne Rivers. Noted for its rolling hillsides and lush landscapes, it is the largest Bordeaux region and offers some of the best Sauvignon Blanc and Semillion in the world. With sumptuous tropical fruit aromas, the wine is a standout in its iconic electric blue bottle. Bordeaux, in south-western France, is arguably the most famous wine regions in the world. The Bordeaux viticultural region stretches for 80 miles inland from the Atlantic coast and is home to more than 10,000 producers. The majority of Bordeaux's wines are the dry, medium-bodied reds for which the region is known. The success of Bordeaux is closely related to its climate and geography. The two prevailing red wine-producing subregions of Bordeaux are referred to as Left Bank and Right Bank. Left Bank Red Bordeaux wines are blended together from the dominating grape Cabernet Sauvignon, Merlot, Malbec, Cabernet Franc and Petit Verdot, while Right Bank wines focus more on Merlot. White Bordeaux is well-regarded for wines produced within specific areas. The grapes of White Bordeaux include Sauvignon Blanc, Semillon and Muscadelle.